Stroke occurs when a blood vessel feeding the brain bursts or is clogged, causing a sudden disruption in the blood flow to the brain. 50% of nursing home admissions are stroke victims. Imagine walking down the hall of a nursing home. Every other room would be occupied by a stroke victim. Stroke is the number one reason for nursing home admissions. 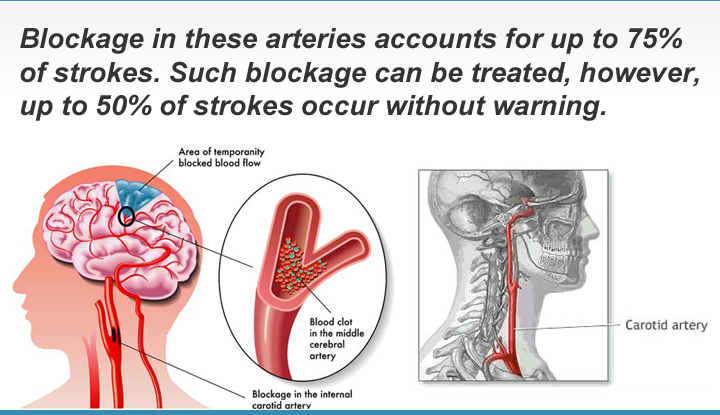 More Info: Learn how we screen for Strokes and Carotid Artery Disease.